I thought I had an ongoing tale about the door knob but I can’t find it using search. Oh well, it’s so interesting I’m sure you won’t mind hearing it again. Our front door knob started disintegrating awhile back and co-worker said door knobs are super easy to do yourself so I decided to try. I stopped by the lock shop to ask a few questions and the nice man told me to bring it in. I figured out how to take it off and I put all the pieces in a box and drove back to the lock shop. The nice man said I could probably get by without a whole new door knob and he sold me a widget. (Latch? Hasp? Shackle?) I went home installed the widget and put the door knob back on and couldn’t get the door to close. These all sound like simple steps when I write it this way but they actually involved having to look for tools and wrestle to make the tools work and get the screws in the right way. Plus I had other things I wanted to do with my day besides drive back and forth with a shoe box filled with door knob parts. I called the nice man and begged him to come down and fix it. At that point I would rather have paid money than deal with it one more second. He said it sounded like I had the bevel hackle knuckle upside down and to just turn it around. So I took it all apart again and spring bolted the tumbler around and he was right it worked! Fast forward to a couple of weeks ago and the door knob disintegrated again. My husband, who is a prince but is perfectly happy to leave problems like this to deal with later if there is an acceptable alternative, thought we should just not use the front door until we got around to dealing with it. I did not find that an acceptable alternative. However, I also didn’t want to be in charge of calling the locksmith since I had already handled round one of this problem. Then, during one long night of insomnia I remembered that we have the same door knob on the door between the garage and the shop — a door that we never lock. When I had time I swapped the doorknobs. Genius. Except that didn’t work either because the widget part was still stuck — where this entire problem started — so one more time I had to go back, take both door knobs off, swap the widgets putting the new widget back on the front door and putting the craptastic old widget in the garage. 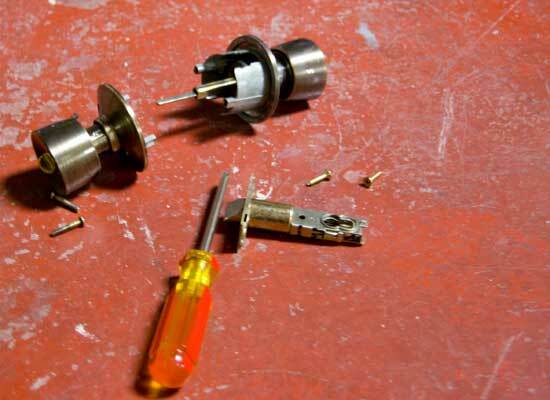 In sum, front door locks again and I know how to deal with basic door knob repair. You are my hero!!! I couldn’t have done any of those things. Or wouldn’t, for fear of failing. Your husband is lucky to be married to a take-charge person, unlike my husband, who is married to a let-it-slide person. I would have just moved.